Volvo 280 legs serviced by Vector Marina. GPS , Radio , Depth sounder , Bilge Pumps and Blower, 3-60w Solar panels with breaker Box , Battery Charger and Monitor. 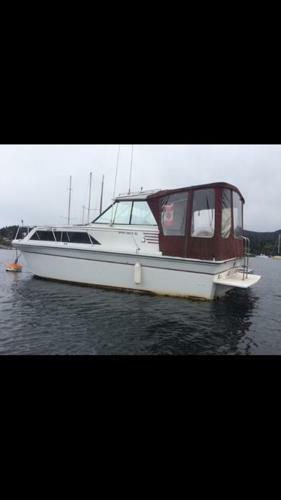 3 Batteries , Trim Tabs , Fridge, Kerosene Cook Top and heater , Stainless Sink ,Flush Toilet , Hot Water Tank , Fresh Water Tank , Holding Tank , Complete Interior Rebuild to Modernize the Boat , All in Great Condition. Full Back Canvas , Anti-fouling .